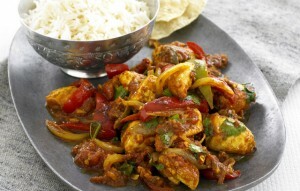 Chicken Karahi With Capsicum recipe by Sabeen Younas at DesiRecipes.com. Add chicken and salt in it . Fry it till chiken gets dry and dark brown. Add all other spices in curd and pour it in pan again stir chicken for few minutes then add tomato juice into it. Stir till all the water evaporate. In the end add capsicum(dont fry more than 2 minutes after adding capsicum).